A pick-and-pop, even if it’s between Ersan Ilyasova and Brandon Knight, is often a tough play to defend against. It’s a play that causes mismatches and gives an offense options. For most teams, it’s an effective tool. For the Dallas Mavericks, it’s an instrument of total destruction. Because no one has ever impacted the game with a single play the way Dirk Nowitzki can with a pick-and-pop. Over the course of his career, Nowitzki has dominated, manipulated, and confused defenses by deploying his unique ability to score in one of the hardest plays to guard in the NBA. Even at 35, he still forces opposing defenses into the same arduous decisions they’ve been dealing with for years. As head coach of the Denver Nuggets for nearly a decade during Nowitzki’s prime, George Karl knows this all too well. If basketball games are chess matches, playing with Dirk is like playing with a board full of queens. Nowitzki is one of the rare pick-and-pop players who possesses a counter to any scheme a defense throws at him. Not every sweet-shooting big man can put the ball on the floor. Others can’t exploit the smaller player switching onto them. Only a select few truly terrify teams with their shooting ability. Nowitzki, however, does all three better than anyone else. San Antonio is just the latest team that forced to try to solve the fundamental problem posed to every opponent that comes up against Dirk. How do you guard the unguardable player making the unguardable play? One choice a defense can make is to stay with Nowitzki at all costs. This makes sense. Defenses justifiably fear what Dirk can do if he’s given the opportunity to pop into any open space after screening. Anyone who has watched the NBA in recent years knows exactly what this looks like: Nowitzki screens for a teammate, steps behind the 3-point line, and uncorks that gorgeous, high-arching jumper, while a helpless defender tries in vain to contest the shot. There are two coverages teams can use to stop Dirk’s deadly outside shooting. The first is called a “stay attached” coverage, where the opposing big man literally stays in physical contact with Dirk. As the big man defending Dirk makes a token effort to get into the path of the ball handler, the big man’s teammate guarding the ball takes a long, circuitous route under the screen. Another is where the big man lunges out toward half court — losing contact with Dirk for a brief moment while forcing the ball handler to take a few dribbles away from the basket — before recovering like a man possessed back to Nowitzki. When executed well, these two coverages can minimize open looks for Dirk. But focusing so much attention on Nowitzki comes with a price. Huge holes open up in other parts of the defense, something Nowitzki’s teammates have exploited not only this year, but throughout his career. Karl points out that Jason Terry and Nowitzki used to captain the best fourth-quarter offense in the NBA. J.J. Barea can essentially chalk up the lucrative contract Minnesota lavished on him to the success he experienced with the NBA’s premier pick-and-pop partner. And this year, Monta Ellis, Jose Calderon, and Devin Harris have all benefited. Those “other ways” usually come in the form of layups, foul shots, or open 3s. Defenses can make a Dallas player other than Dirk take the shot after a pick-and-pop, but that’s not always a good option. Even when he doesn’t touch the ball, Nowitzki’s presence can completely unlock the floor for his teammates. If opponents stay with Dirk, his teammates have a field day against an overmatched defense. If they choose to stop his teammates, one of the game’s all-time great scorers makes will likely them pay. The only option left is to use a coverage that could potentially stop both and eliminate Rick Carlisle’s clever tactical tweaks from the equation. That option is called switching. “With Dirk we liked different looks, but we basically lived with the switch and said, ‘Go get 50.’ And he did a couple nights,” Karl says with a laugh. Trading assignments is the ideal solution to snuffing out a dangerous pick-and-pop duo. In theory, a switch should stop guards from penetrating the defense, as well as bother a big man raining down open 3s. Switching is the pick-and-pop’s Kryptonite. It forces an offense to then attack a mismatch in isolation — big defender on smaller guard, small defender on big man — which isn’t nearly as easy at it seems. Most big men who spend their time shooting from the perimeter often do so because they’re not exactly Hakeem Olajuwon on the block. Even if they can beat up on a smaller defender, it takes precious time off the shot clock to move down to the block and get the ball swung around and then entered into the post. That leaves little or no time for the big to get off a good shot. Guards can have trouble in isos against a big man, too. Today’s frontcourt players in the NBA are more mobile than ever, trained to concede long jumpers when facing off one-on-one against smaller, quick players. This is why it’s nearly impossible to find an efficient shot against the switch. So rather than navigating a complicated two-person routine to cover a pick-and-pop — and risking giving up great shots — teams with the right personnel can just switch and force the offense into a middling result at best. During the early years of his career, Nowitzki was plagued by switching. Avery Johnson was both an assistant under Don Nelson and head coach in Dallas during Nowitzki’s formative years in the league, and dealt with the problem firsthand. Johnson estimated that “75 percent” of opposing teams used a switch against Dirk to take away the threat of his 3-point shot. 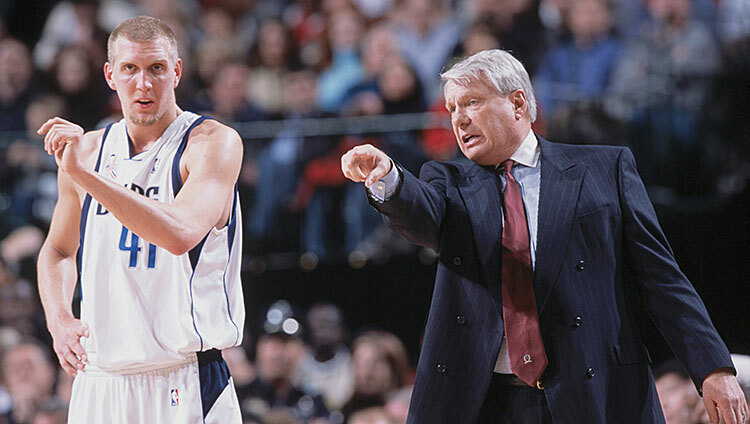 With no alternative to punish teams that deployed a this scheme against Nowitzki’s pick-and-pops, the innovative Nelson came up with a strange idea. Instead of posting up Dirk at the block, and risking not being able to get him the ball in time to attack a defense, he’d have Nowitzki set up a shot at the center of the free throw line, known as the “nail” in hoops lingo. It was a clever ploy. It made double-teaming Nowitzki to get the ball out of his hands a dicey proposition. “At the nail, he can see the whole floor. He can pass to both corners, which makes it really difficult for help to come,” Steve Nash says. The nail has become fertile ground for some of the league’s scorers, like Kevin Durant, LeBron James, Carmelo Anthony, and Paul Pierce. But it’s not like any player on NBA roster can succeed there. Nowitzki’s size, handle, and shooting ability are very rare — even among elite players. And I haven’t even mentioned his otherworldly ability to hit the crazy, off-balance, one-legged shots that have long been a trademark of his game. Over the past few years, fewer than a handful of teams have dared to let a smaller defender take his chances with Nowitzki on the nail. Oklahoma City is one of the only foes that still switches onto him regularly. Nelson, Johnson, and Nowitzki combined to create something never before seen in the history of the league. “You gotta understand that going to the nail post-up didn’t exist before Dirk,” Karl says. The free throw line is still 15 feet from the rim. In other words, it falls into the range of what’s known as the dreaded “long 2.” When ordinary players are forced into a shot near the nail, it’s considered a win for the defense. But Nowitzki isn’t an ordinary player. I can’t stress this enough: You’re not supposed to shoot this many long 2s and still have good percentages. For every other player in every other league in the entire world, the long 2-pointer is the worst shot in basketball. But it’s not if you’re Dirk Nowitzki. He was the second best in the league at shooting from 10-23 feet last season, but the even more amazing part is in the “attempts” column — he took nearly 10 a game. Well more than half his shots were long 2s. Unlike the rest of the planet, Nowitzki is so uncannily accurate that he can dominate games this way. Of all the great pick-and-pop players, this is what makes Dirk unique. A shot from anywhere on the court is a good look for Nowitzki. No other player, except for perhaps Steph Curry, is such an accurate and skilled shotmaker that they make even long 2s efficient. And guess what? This drives opposing coaches nuts. “I don’t ever remember game planning for a player as a coach and being kinda conflicted because this guy makes a shot you want everybody in basketball to take,” says Karl. Very few players can make a coach reconsider his entire defensive philosophy for one game. Yet it’s unlikely that Karl is the only coach to ever question his approach in games against Dallas. It’s this skill, combined with an innovative tactic from Nelson, that turned the pick-and-pop with Dirk from a hard play to guard into an impossible one. Even after taking the Spurs to the brink so far in the playoffs, Nowitzki still faces an uphill battle to extend his season past the opening round. Another long offseason will follow, and when the big German returns to training camp next fall, it will be for the start of his 16th season in the league. At some point, the Dirk we’ve come to admire will finally fall victim to Father Time. The leaning, one-legged fadeaways will go in with less frequency, and the legs and energy necessary to power past opponents off the dribble will deplete, as well. It’s the depressing inevitability of the passing years. Whenever a legend from the past ultimately succumbs to age, NBA fans are left wondering if they will ever see a player like him ever again. But while we’ve seen players similar to all-time greats like Jordan and Magic come along, it’s hard to imagine getting another one as uniquely dominant as Nowitzki. He’s made something commonly seen in an NBA game — a simple pick-and-pop — into a bundle of points and entertainment on a nightly basis.